I remember first looking at these colors when I was thinking about ordering from Aromaleigh...but I'd never bought anything from them before, the prices looked high (thank goodness for the regular sales), and so I waited. And then the colors were gone. I got a jar of one through an Ebay charity auction, and hoped that they'd come back one day...which they did. And instead of ordering just one more pot of the one color I had managed to snag, I made a thorough pass through and ended up owning eight of the twelve colors. The texture of these is, surprisingly, kind of plush. They apply with a pretty sheen, and while they do have lots of glitter and sparkle, they don't feel gritty or have lots of fallout. 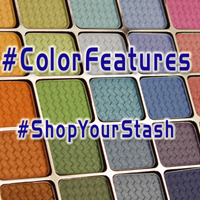 Since many of these colors were made using discontinued pigments, they won't be made part of the permanent line - unlike the colors from the other Aromaleigh 2008 LE collections. I was also unable to get samples of those colors I chose not to purchase, since no samples were available.